Samsung is all set to launch its new flagship Galaxy Note series smartphone Galaxy Note 8 on August 23rd event in New York and we have seen the device already in a number of leaks and rumors. Now, the Samsung Galaxy Note 8 has received the FCC certification and has confirmed the model numbers for the device. 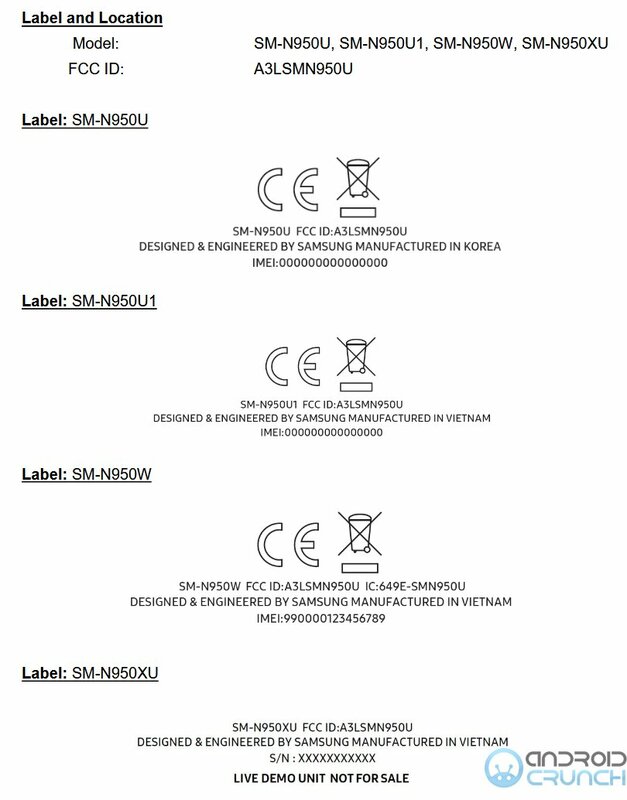 The two separate FCC fillings for the device confirms the model numbers SM-N950F and SM-N950U and some additional model numbers like SM-N950U1, SM-N950XU, SM-N950W, SM-N950F/DS and SM-N950X. The SM-N950F/DS confirms that we will also have a dual SIM variant of the device that might support Hybrid dual SIMs. No other details about the device are currently avbailable from the FCC listings. According to the rumors, the Galaxy Note 8 will feature a 6.3 inch edge-to-edge AMOLED display with 18.5:9 aspect ratio and is similar to the current Samsung Galaxy SS series flagships Galaxy S8 and S8+. The Galaxy Note 8 will be powered by the Exynos 8895 and Qualcomm Snapdragon 835 processor and the device will have 6GB of RAM. It will run on the Android O 8.0 OS out of the box and might feature Hybrid Dual SIMs in some regions. The Galaxy Note 8 will be the first Samsung phone to feature a dual camera on the rear side with two 12-megapixel sensors and will have independent optical image stabilization for the lens. The Galaxy C7 2017 is also coming with a dual rear camera and has already got the TENAA approval confirming the specs and the images revealing the design of the device. Evleaks further claims that the camera lenses will be configured horizontally, and will be placed to the left of the flash and heart rate sensor. The fingerprint scanner will be placed on the rear side just like the Galaxy S8 Duo, it will be placed on the rear panel to the right of the flash and heart rate sensor. The device will be backed up by the same 3300mAh battery that powered the Galaxy Note 7 and will have an improved S-Pen that will allow its users to perform full-sentence language translation and currency conversion. It will be available with black, blue, and gold color options and will have a €999 retail price. The Samsung Galaxy Unpacked event will start on August 23, 2017, at Park Avenue Armory in New York City with doors opening at 10 a.m. (EST) and the official event will start at 11 a.m. (EST).